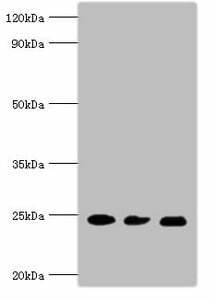 Small volumes of anti-RAB5A antibody vial(s) may occasionally become entrapped in the seal of the product vial during shipment and storage. If necessary, briefly centrifuge the vial on a tabletop centrifuge to dislodge any liquid in the container`s cap. Certain products may require to ship with dry ice and additional dry ice fee may apply. The small GTPases Rab are key regulators of intracellular membrane trafficking, from the formation of transport vesicles to their fusion with membranes. Rabs cycle between an inactive GDP-bound form and an active GTP-bound form that is able to recruit to membranes different sets of downstream effectors directly responsible for vesicle formation, movement, tethering and fusion. RAB5A is required for the fusion of plasma membranes and early endosomes. Contributes to the regulation of filopodia extension. NCBI/Uniprot data below describe general gene information for RAB5A. It may not necessarily be applicable to this product. RAB5A: Required for the fusion of plasma membranes and early endosomes. Contributes to the regulation of filopodia extension. Binds EEA1. 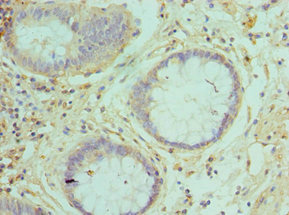 Interacts with RIN1 and GAPVD1, which regulate its pathway, probably by acting as a GEF. Interacts with ALS2CL, RABEP1, SUN2, ZFYVE20 and RUFY1. Interacts with SGSM1 and SGSM3. Interacts with PIK3CB. Regulated by guanine nucleotide exchange factors (GEFs) which promote the exchange of bound GDP for free GTP. Belongs to the small GTPase superfamily. Rab family.